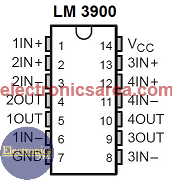 This 4-channel audio mixer uses the LM3900 integrated circuit which has 4 operational amplifiers. This allows us to use a single integrated circuit, some resistors and capacitors, to implement the audio mixer, with a very simple design. The circuit has two channels for microphone inputs and two channels for inputs of other devices. 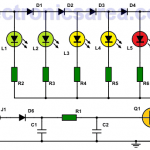 If you want a mixer with more input channels, you can duplicate this circuit and get a mixer with up to 8 channels. Large bandwidth, which allows to amplify audio signals without problems. You can use voltage sources of +32 volts maximum or dual +/- 16 volts maximum. How the 4-channel audio mixer works? 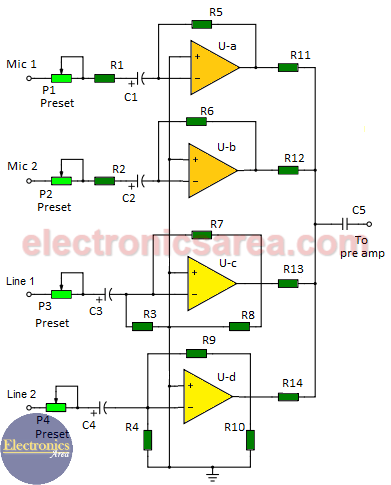 The amplification (gain) of each channel is controlled with 1 potentiometer. Four channels means that we will use 4 potentiometers (P1, P2, P3, P4), placed at the inverting input of each amplifier. Each potentiometer controls the audio level of each channel before amplifying the signal and performing the audio mix. All operational amplifiers are configured as inverting amplifiers and have decoupling capacitors at their inputs and outputs. These capacitors filter (block) the direct current component of the signals at the input and output, amplifying only the alternating signal (the audio signal). Temperature to Voltage Converter using Thermistor (PCB) How to Make a Car Temperature Alarm using 741 and 555 ICs?